7150 - 7155 Inline Manual Shut Off Gate Valve Series Drain - Jay R. Smith MFG Co. Functions as a drainage control valve; flapper type backwater valve provides temporary protection against sewage backflow surges. 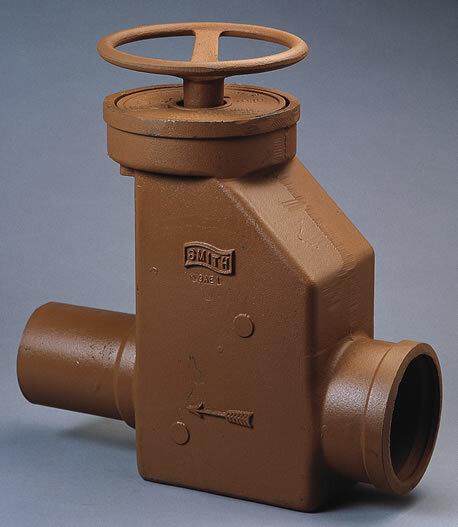 Manually closed "spade" type gate valve provides additional complete "closure" protection during emergency conditions, when building is completely shut down or during extended periods of backflow conditions. Duco Cast Iron Body and Cover with Removable Wheel Handle. Bronze Gate and Bronze Flapper Valve. Cast Iron Extensions as Indicated by Figure Number Selected. Smith No. 7150 cast iron body and cover removable wheel handle, bronze gate, flapper valve and brass stem.